Marine Corps Air Station Yuma, a premier air-to-ground aviation training base, is located in Yuma, Arizona. The base shares a joint civilian-military airport with Yuma International Airport and is situated along the Colorado River in the Sonoran Desert. Prominent units include the Marine Aircraft Group 13, Marine Aviation Weapons and Tactics Squadron 1, Marine Air Control Squadron 1, Combat Logistics Company 16, Marine Wing Support Squadron 371 and the USMC Reserve Marine Fighter Training Squadron 401. MCAS Yuma is home to the Weapons and Tactics Instructor course. 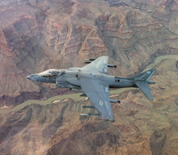 Aircraft flown at Yuma include the AV-8B Harrier II, the F-35 Lightning II and the F-5N Tiger II, as well as the RQ-Shadow and the RQ-21 Blackjack unmanned aerial vehicles. This MCAS Yuma directory features the critical info you'll need to navigate through the many facilities and recreational opportunities available on base.